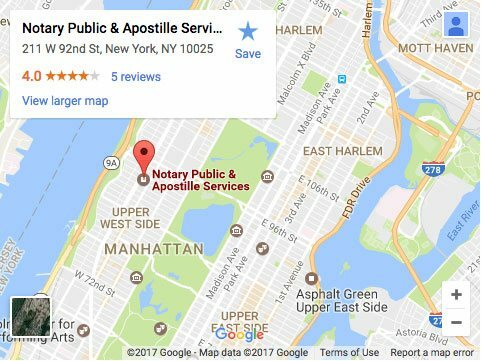 Notarizing NYC for 40 Years! Traveling Notary and Apostille services are available 24/7 with an appointment. Please visit us inside the Metro Frame & Art store located at 211 W. 92nd Street between Broadway & Amsterdam. Open Monday through Saturday from 11am - 5pm without an appointment. Quick and easy. Took about five minutes and was only 5 bucks. Nice guy and he still uses the official notary seal which I love. I'll definitely be back again for my future notary needs. He has been tremendous and insightful in helping my business with all our different notary needs! Kind & courteous notary service. And it was a Saturday!! Located in Metro Frame strore, Hank is very nice and knows all the forms and advises you of any helpfull tips. All other notaries i know just stamp and go... they dont check if the form is correct or wrong, if you have to come back they charge you again 3 dollars. We provide Notary Public Services for individuals and corporate entities in communities throughout the New York State, the New York City region and Long Island, including but not limited to Manhattan, Queens, Bronx, Brooklyn, Richmond, Long Island City, Nassau County, Suffolk County, Garden City, White Plains, the Hamptons, Yonkers, Kew Gardens, Forest Hills, Astoria, Jamaica, Brooklyn Heights, Park Slope, Carroll Gardens, JFK Airport, LGA Airport and Rockland, New York.